On its first anniversary, it seemed that Shichiku developed the same atmosphere as that of the Chiiki no Chanoma or My Parents’ Home. Shichiku was well recognized as a place where community people could feel at home. At this point, Ms. Kawada came up with a system called ‘the Hands of Parents' Home in which people can help one another doing chores without hesitation. Here, people may use the admission ticket to the Living Room of Parents’ Home as a ticket also to the Hands of Parents’ Home. 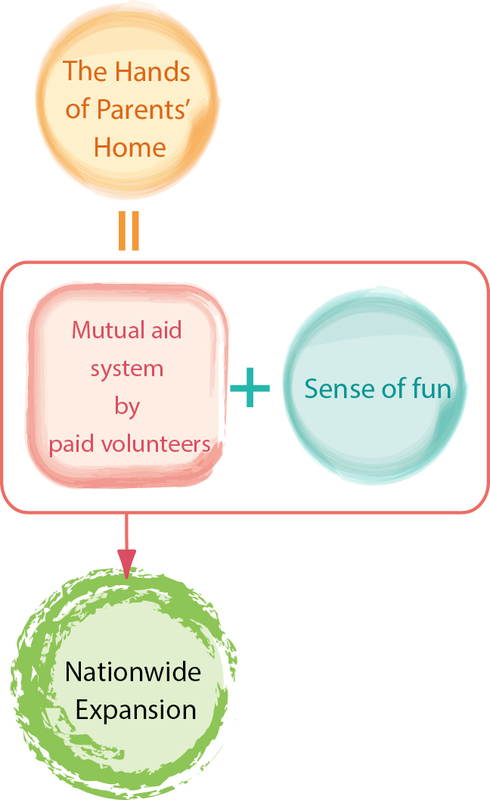 This concept is similar to that of Magokoro Help, a mutual aid group of paid volunteers. This group was also created by Ms. Kawada. As the Hands of Parents’ Home includes the element of fun, I am expecting that, in no time, it will become well known to the members of the Community Living Rooms all over the country. I believe the Hands of Parents’ Home will become the culmination of her various endeavors, such as the Magokoro Help, meal delivery services, the Chiiki no Chanoma, My Parents’ Home and other effective measures to help contribute to the super-ageing society. I salute Ms. Kawada for her ideas and ability to get things done. The Hands of Parents’ Home is a ticket system utilizing the admission ticket to the Shichiku  Parents’ Home Living Room. It is used for giving and receiving mutual aid among the participants. It costs ¥300 per service and a set of six (6) tickets is sold at ¥1,500. The participants can ask for and offer help from/to each other in doing such chores as taking garbage to a designated place, shopping, replacing bulbs, taking care of pets, etc. The participants give and receive the tickets directly among themselves and they can use the same tickets when they enter the Living Room. In this way, the participants can receive help without reserve. I think this system not only addresses challenges when creating a community but it can also contribute to resolving issues relative to a super-ageing society. We can say that this is a new and updated version of the old Japanese cultural system of helping one another the way the original Japanese communities used to do before it became a modern society. If the Hands of Parents’ Home and the Chiiki no Chanoma spread all over the country can function together, I think we can expect a reborn Japan where people can live with ease.